December 9, 2016 – Eight microsatellites designed and built for NASA at Southwest Research Institute (SwRI) are being readied for a December 12 launch. The Cyclone Global Navigation Satellite System (CYGNSS) constellation will “see” through thick clouds and heavy rains to measure the movement of ocean waves beneath hurricanes. The mission’s goal is to accurately measure wind speeds and hurricane intensification for the first time. SwRI has a decades-long record of developing and operating NASA science instruments and missions. However, CYGNSS marks the first time SwRI has engineered and constructed complete satellites for the agency. After launch, the eight microsatellites — each roughly the size of a carry-on suitcase when the solar arrays are stowed — will be oriented in a pattern that allows successive satellites to pass over the same region every 12 minutes, with a median revisit time of less than three hours. Once positioned, the satellites will operate with minimal course adjustments throughout the two-year primary mission. The radar detection instruments aboard the constellation will create mapping images representing ocean surface roughness, which is directly related to the surface wind speed. Each microsatellite produces a map image of a GPS radar reflection point at a rate of up to four images per second. Wind speeds are derived from measurements of signal reflections covering 15.5 square miles of ocean surface. Together, the eight CYGNSS satellites can produce 32 wind measurements per second. The CYGNSS constellation will be air launched from a Pegasus XL launch vehicle dropped from an L-1011 Stargazer aircraft. A chase plane will broadcast live footage of the launch. The microsatellites are expected to deploy and begin testing and operations within the first 24 hours. Full hurricane science operations will begin in January — well in advance of the 2017 hurricane season. 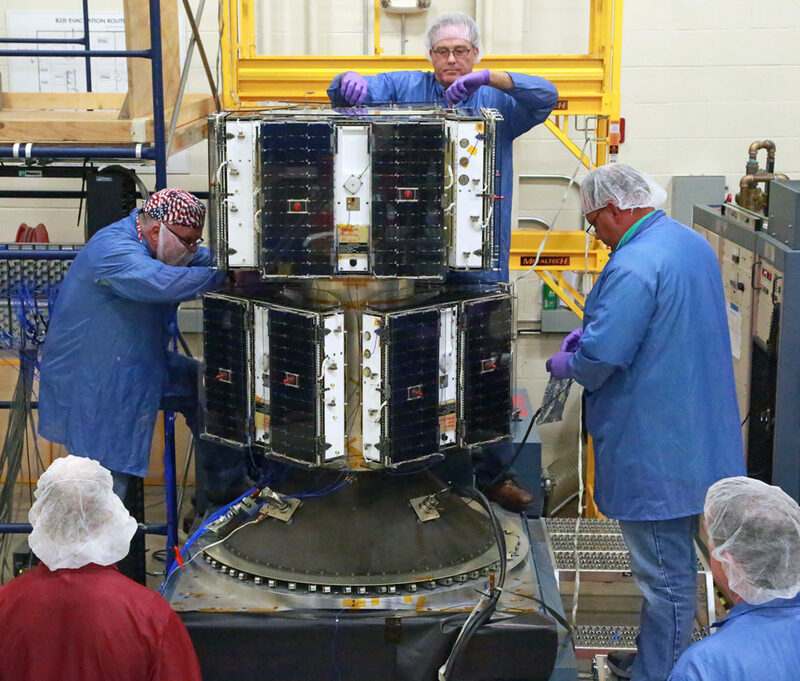 The CYGNSS Mission Operations Center at SwRI facilities in Boulder, Colorado, will receive the microsatellites’ data and route them to the Science Operations Center at the University of Michigan after initial processing. The Space Physics Research Laboratory at the University of Michigan College of Engineering leads the overall mission execution, and its Climate and Space Sciences and Engineering Department leads the science investigation. Dr. Chris Ruf of the University of Michigan serves as CYGNSS principal investigator. The Earth Science Division of NASA’s Science Mission Directorate oversees the mission. The deployment mechanism for the CYGNSS satellites was built by Sierra Nevada Corporation.